The Lahartara Talab (pond), which is associated with the birth of poet and saint Kabir is in pathetic condition. Once a big pond of fresh water, where as legend says infant Kabir was found floating on a lotus leaf, is today a swamp of wastewater and filth, showing the indifference of government machinery as well as local citizens towards the heritage site. In the past, the talab was spread in an area of over 17 acres but today it is losing its grandeur. A portion of about 3.5 acres of talab is protected by the directorate of archaeology, Uttar Pradesh, while another piece of about 8 acres is under the possession of Sadguru Kabir Prakatya Dham. The remaining portion of the water body is being converted into the mess of concrete structures. VARANASI: The Lahartara Talab (pond), which is associated with the birth of poet and saint Kabir is in pathetic condition. Once a big pond of fresh water, where as legend says infant Kabir was found floating on a lotus leaf, is today a swamp of wastewater and filth, showing the indifference of government machinery as well as local citizens towards the heritage site. In the past, the talab was spread in an area of over 17 acres but today it is losing it s grandeur. 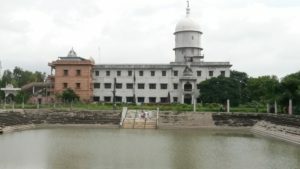 A portion of about 3.5 acres of talab is protected by the directorate of archaeology, Uttar Pradesh, while another piece of about 8 acres is under the possession of Sadguru Kabir Prakatya Dham. The remaining portion of the water body is being converted into the mess of concrete structures.Only good thing is that the portion of the pond owned by Sadguru Kabir Prakatya Dham is being managed in better ways with the construction of a grand memorial and a pucca pond within the pond. “The construction of the memorial is still on,” said chief of panth Hazoor Ardhnam Saheb. It is unfortunate to see the shrinking of the historic pond. The organisation purchased the portion of the pond for the development of the memorial of Sant Kabir. The portion of the pond protected by the directorate of archaeology is neglected. The houses situated along the pond discharge the wastewater into it and the place has also become a centre of open defecation. Though a fund of Rs 10 lakh was spent on its beautification in 2003, no sign of improvement is noticed. The boundary wall is broken at many places. The entry point has also been closed permanently. The locals use the place for dumping household waste without understanding the importance of water body. One can see cow dung cakes drying around the plaque fixed at the time of the beginning of beautification work. This portion of the pond was enlisted with the directorate of archaeology in 1967. The directorate carries out annual maintenance work at the monuments protected under the State Act. As and when required, major conservation works are also undertaken particularly in respect of monuments, which are in advanced stage of decay. The regional unit of the directorate of archaeology finds it difficult to maintain and protect the Lahartara talab. “Efforts are being made to hand over the pond to the tourism department so that its tourism potential could exploited,” regional archaeological officer Subhash Chandra Yadav said. He admitted that the place is being abused by the locals and it is not possible for the department to put a check on it. “On our recommendation, the tourism department has forwarded a proposal for the development and beautification of the pond,” said Yadav, adding that it has also been proposed to construct drain on pillars to intercept waste water from the houses. Lahartara Talab is situated near the GT Road on Allahabad route. It is about 2.5km from the Varanasi Cantonment railway station.